✔ and many more resources! All genres of music are accepted! Take another step forward in your music career and Sign Up! Radio shows, bloggers, A&Rs, and others looking to receive indie music are more than welcome to Subscribe to our new music site to access our promotional channel - P3 Hits. We will send you quality, undiscovered music via email in any genre that you wish! Start promoting your songs the smart way! With digital music consumption on the rise, the music world is getting crowded! Push Power Promo can help you stand out from the competition. We promote music from hard-working, talented artists every day. Our music services are top of the line! Not only do we offer free music promotion on our blog, but we connect our community of musicians and artists to hundreds of free opportunities throughout the year including radio shows, podcasts, label submissions, music contests, others blog platforms and more. Over the past several years, we've witnessed our members and clients get placements and new fans from a broad range of opportunities on the net. You'd be surprised how many sites and companies are looking for good, independent music to promote! There are literally thousands of places that offer music discovery opportunities; we've been studying, documenting, and building connections with places for a long time! If you're looking for outlets to get your songs heard by more people across the globe, but don't know where to start, this is the place for you. Let us help your career by offering you some of our resources and knowledge of the music industry. 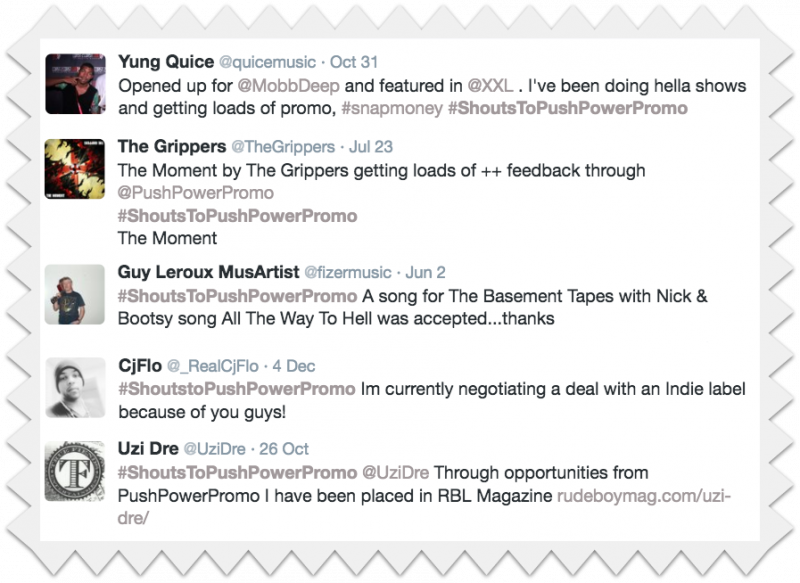 We offer a variety of options in Music Promotion including Promotional Packages, a daily blog to promote music from Underground/Indie Artists, Youtube music promo, Facebook Promo, Twitter promo and much more! For details, please visit the Promotional Services page to get the scoop on how we promote music. We've been in the music marketing and PR business for over 10 years and look forward to servicing musicians and artists worldwide for a lot longer! If you are not already a member and would like to sign up for free to benefit from our variety of resources for indie and unsigned music makers, follow this link. Our recurring Soundcloud contest has been going for over 10 volumes and 5 years! We accept submissions in all genres for a chance to be featured on our song compilation that consists of 10 amazing hit songs from independent artists and bands from across the globe. Song submissions are judged based on raw talent, creativity, lyricism, and audio quality. We promote each of these compilation projects via on-site advertising, email marketing, and PR campaigning. For those who are ready to find opportunities in the music world they can submit to, our Opportunities section is a perfect fit for artists in all genres. 5 days a week, we post opportunities that include radio stations, magazines, contests and labels who are in search of Indie music. In exchange for this information, our members must first show support to a fellow artist by previewing another member's music on Soundcloud, at no cost to either party! For our members and clients who have excelled in creating very appealing musical works, we offer a variety of free, paid and non-exclusive deals to market talent across the globe. For these types of offers, we can only accept less than 10% of the music submissions sent to us, to ensure only the finest quality music is being marketed to our connections and audience base. Sending an amazing song out to the masses has a very different effect than sending out a decent song with potential to the masses. To ensure successful campaigns, we have to be very picky about the talent we chose to promote on a large scale.